There are more than 70 museums in Cornwall of great variety and individuality, including; art galleries, castles, mines, historic properties, industrial heritage sites and tiny community museums. Many more collections are held in community archives. Cornwall’s diverse heritage organisations offer something unique and special, they provide fantastic services for their communities and achieve high standards. Cornwall Museums Partnership and SW Museum Development recognise the excellence within these organisations, and believe there is a lot we can learn together and from each other. We want to reward the wonderful work you do, and share your achievements. Cornwall Heritage Awards will celebrate our museums and heritage organisations. It will raise profile within our local communities, across Cornwall, and within the wider heritage sector. It will showcase your best practice and share your great ideas. To do this we are working with some exciting media partners including BBC Radio Cornwall. Innovation Award – a new initiative, project or way of working that has made your organisation more resilient, innovative or entrepreneurial. Best Project on a Budget – a project of any kind that has brought benefits to your organisation and cost less than £500. Environmental Award – any initiative that has made your organisation more sustainable and/or environmentally responsible, no matter how small the project. Audience Initiative – a project that has attracted and engaged with new audiences for heritage. Family Friendly – the wide variety of activities and services you offer to provide all-round excellent family visits. Heritage Heroes – an opportunity to celebrate the work of a volunteer team who have achieved something particularly special. Cornish Object of the Year – this year it’s all about promoting Cornish heritage. What are the interesting, amazing or peculiar objects or archives that tell the story of our heritage? This category will be awarded by public vote. It is an opportunity to raise profile and reach wide public attention. Judges’ Special Award – This will be awarded to the excellent project or organisation that the judges feel most merits additional commendation. It will be selected from applications for categories 1-5. Organisations will nominate their own projects for consideration. The work you nominate must have been undertaken during the last year. Please consider the full variety of work you do; behind the scenes, outreach activities, exhibitions and community projects, when thinking about what to apply for. A celebratory Heritage Awards ceremony will take place on 21 March 2019 at Trenderway Farm near Looe, where the results will be announced. The event will offer a great opportunity to hear first-hand about the excellent work that’s been going on and catch up with friends and colleagues from museums and heritage organisations. Museums and heritage organisations will be able to nominate something for one or more categories using the appropriate application form. Organisations can submit more than one application for each award or nominate the same project for different categories. The closing date for applications is 5 pm on 14 December 2018. There will be no extension this year. The assessment process will take into consideration the scale of your organisation and the impact your project has made. Please make sure relevant details are included in your application so assessors can make informed decisions. Each category will be shortlisted by a panel overseen by Emmie Kell, Chief Executive of Cornwall Museums Partnership. A maximum of 3 applications will be shortlisted for each award. All applicants will be informed of the outcome of the shortlisting process by 25 January. If your project is shortlisted, you will be invited to submit further details in support of your application such as; background information, visitor comments, photographs or other information. Judging will be undertaken during January-February by a panel of independent experts. All applications will be confidential up until and if they are shortlisted. The final results will be announced at the Heritage Awards ceremony. Why should your organisation take part? This is a great opportunity for you to shout about your achievements. 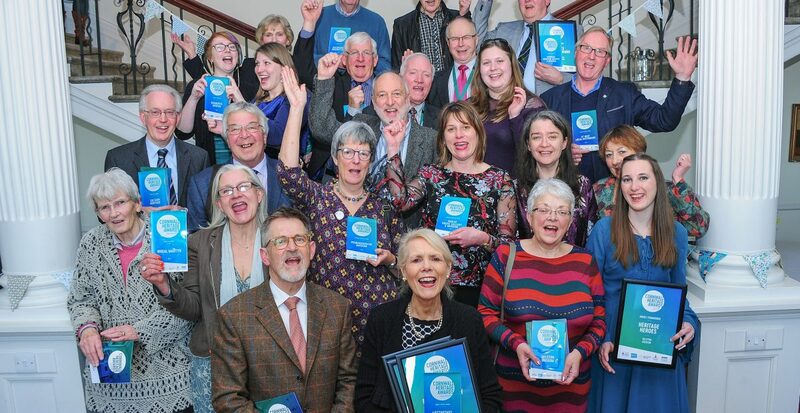 Heritage Awards is designed to recognise and reward achievement, inspire pride, raise the profile of your organisation and of all museums and heritage organisations in Cornwall. Everyone will have the potential to benefit from the publicity created. Last year we generated more than 20 pages of newspaper copy, held 3 radio interviews and reached a huge social media audience. We will showcase each category online and will work with BBC Radio Cornwall to generate coverage for shortlisted museums. Each shortlisted application will be profiled at the awards ceremony and best practice case studies will be produced for the CMP website. The ceremony allows a great opportunity to network with other heritage organisations and funders. Awards and achievements help to inspire a sense of trustworthiness, pride and credibility. Entering the awards is a great way of offering recognition to your team. Winners of each category will receive a plaque and shortlisted museums will receive a certificate of commendation. To take part in the Heritage Awards scheme your organisation must be a heritage site, museum or archive with a heritage collection, even a small one, that is accessible to the public. To ensure we celebrate success across the full scale and breath of heritage organisations, some awards are limited to smaller organisations, others have separate awards for both small and larger organisations, and one award is open to all (please refer to the table below). Larger organisations – those with 2 or more than 2 full-time equivalent members of staff, or those managed/supported by a larger structure (e.g. The National Trust, CMP National Portfolio museums, English Heritage sites etc.). Small organisations – Any volunteer run organisation, or an organisation that has less than 2 full-time equivalent members of staff, excluding support staff, such as maintenance or catering teams. If you are uncertain which category your organisation nor project fits into, please get in touch.